Eka Padasana is all about balancing. It is usually performed to gain a balance and to give a better control to the body movements. When practiced regularly, the one-foot pose improves the coordination of neuromuscular system and neuromuscular coordination of body. It also strengthens the leg and back muscles and improves the flexibility of the body. The pose also gives a good stretch to the lower back, and shoulders. Ek Padasana means one-foot pose and is termed as a balancing posture. Stand straight on the flat surface. Now, raise your hands above your head. Inhale and same time expand your chest. Join both your hands together and lock your fingers. Next, bend forward with arms stretched in front of you. Slowly exhale when you bend forward. While you do this, raise your right leg backward. Keep forward and make your body parallel to the ground. Make sure that your right leg should be perpendicular to the left leg. 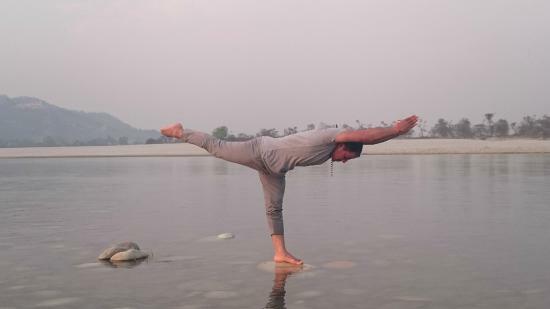 In the final pose, the body, the trunk, and legs should be parallel and straight to the ground forming ‘T’. Concentrate on balance and try maintaining this position as long as you can. Hold the position for a minute, and then switch the sides. Slowly, lower your right lower limb and place it on the ground, beside your right limb. Unlock the fingers and gradually bring both the upper limbs down, with palms touching your thighs. Come back to the normal posture and breath freely. Note – People having high BP or cardiac problems are recommended to avoid Eka Padasana.